• Take Carretera Escénica #1 (Toll Road) South toward Ensenada. • Continue on Carretera Escénica #1 past the 3rd toll booth. It takes about 1¼ hours..
• A few miles before entering Ensenada take the (Ruta del Vino sign) Route #3 exit toward Tecate. • Follow the road through the small town of San Antonio de Las Minas. • Follow the dirt road for 5 minuts (3Km.) 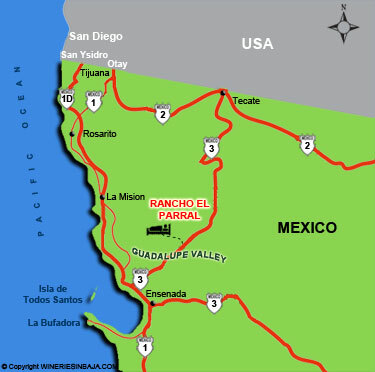 and you will find "Rancho El Parral"
• Take I-805 to Hwy 94 East. • Follow Route #3 South toward Ensenada. • Then follow the directions above.